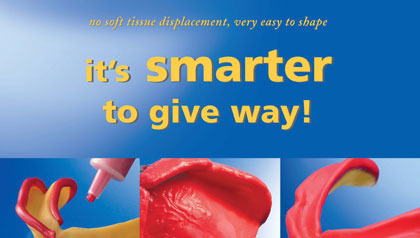 DETAX presents a new, addition curing special silicone, specifically developed for functional impressions and functional margin forming. The material is characterized by its particularly smooth initial consistency and outstanding malleability; safe and easy dosage and handling due to the convenient measuring syringes. reliably; prostheses obtain the secure and solid seat in all functions – and thus more security for patients. The components’ colour-contrast-system (base red, catalyst yellow) enables visual check of dosing and mixing. Detaseal® function impressions are disinfectable and allow, due to the elevated final hardness, an easy processing.